This is “Measuring the Health of the Economy”, section 1.6 from the book An Introduction to Business (v. 1.0). For details on it (including licensing), click here. Understand the criteria used to assess the status of the economy. Every day, we are bombarded with economic news. We’re told that the economy is in a recession and unemployment is on the rise, industrial production has gone down, inflation is going up, housing starts have plummeted, jobless claims have increased, and consumer confidence has sunk to an all-time low. As a student learning about business, and later as a business manager, you need to understand the nature of the U.S. economy and the terminology that we use to describe it. You need to have some idea of where the economy is heading, and you need to know something about the government’s role in influencing its direction. Let’s take a closer look at each of these goals, both to find out what they mean and to show how we determine whether they’re being met. One purpose of an economy is to provide people with goods and services—cars, computers, video games, houses, rock concerts, fast food, amusement parks. One way in which economists measure the performance of an economy is by looking at a widely used measure of total output called gross domestic product (GDP)Measure of the market value of all goods and services produced by a nation’s economy in a given year.. GDP is defined as the market value of all goods and services produced by the economy in a given year. In the United States, it’s calculated by the Department of Commerce. GDP includes only those goods and services produced domestically; goods produced outside the country are excluded. GDP also includes only those goods and services that are produced for the final user; intermediate products are excluded. For example, the silicon chip that goes into a computer (an intermediate product) would not count, even though the finished computer would. By itself, GDP doesn’t necessarily tell us much about the state of the economy. But change in GDP does. If GDP (after adjusting for inflation) goes up, the economy is growing. If it goes down, the economy is contracting. During prosperity, the economy expands, unemployment is low, incomes rise, and consumers buy more products. Businesses respond by increasing production and offering new and better products. Eventually, however, things slow down. GDP decreases, unemployment rises, and because people have less money to spend, business revenues decline. This slowdown in economic activity is called a recessionEconomic slowdown measured by a decline in gross domestic productivity.. Economists often say that we’re entering a recession when GDP goes down for two consecutive quarters. Recent economic conditions indicate we are in a recession. Generally, a recession is followed by a recovery in which the economy starts growing again. 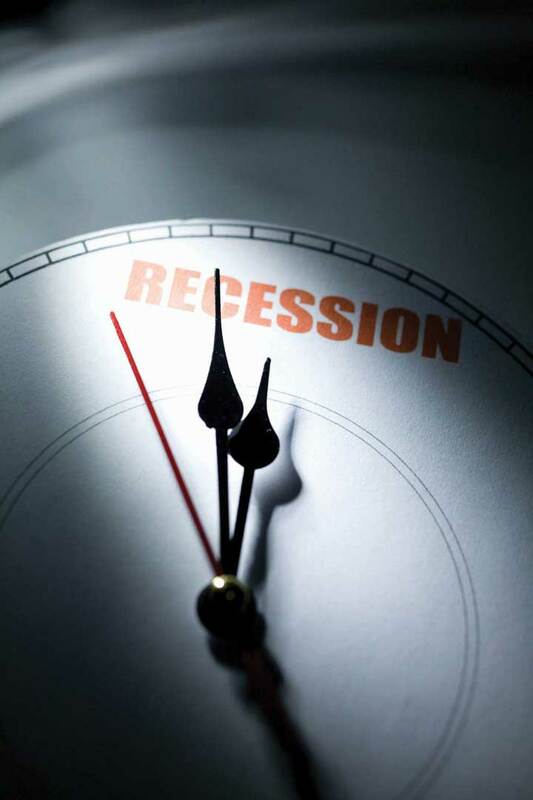 If, however, a recession lasts a long time (perhaps a decade or so), while unemployment remains very high and production is severely curtailed, the economy could sink into a depressionSevere, long-lasting recession.. Though not impossible, it’s unlikely that the United States will experience another severe depression like that of the 1930s. The federal government has a number of economic tools (some of which we’ll discuss shortly) with which to fight any threat of a depression. To keep the economy going strong, people must spend money on goods and services. A reduction in personal expenditures for things like food, clothing, appliances, automobiles, housing, and medical care could severely reduce GDP and weaken the economy. Because most people earn their spending money by working, an important goal of all economies is making jobs available to everyone who wants one. In principle, full employmentCondition under which about 95 percent of those who want to work are employed. occurs when everyone who wants to work has a job. In practice, we say that we have “full employment” when about 95 percent of those wanting to work are employed. The U.S. Department of Labor tracks unemployment and reports the unemployment ratePercentage of the total labor force that’s currently unemployed and actively seeking work. : the percentage of the labor force that’s unemployed and actively seeking work. The unemployment rate is an important measure of economic health. It goes up during recessionary periods because companies are reluctant to hire workers when demand for goods and services is low. Conversely, it goes down when the economy is expanding and there is high demand for products and workers to supply them. A third major goal of all economies is maintaining price stabilityConditions under which the prices for products remain fairly constant.. Price stability occurs when the average of the prices for goods and services either doesn’t change or changes very little. Rising prices are troublesome for both individuals and businesses. For individuals, rising prices mean you have to pay more for the things you need. For businesses, rising prices mean higher costs, and, at least in the short run, businesses might have trouble passing on higher costs to consumers. When the overall price level goes up, we have inflationRise in the overall price level.. Figure 1.12 "The U.S. Inflation Rate, 1960–2008" shows inflationary trends in the U. S. economy since 1960. When the price level goes down (which rarely happens), we have deflationDecrease in overall price level.. The most widely publicized measure of inflation is the consumer price index (CPI)Index that measures inflation by measuring the prices of goods purchased by a typical consumer., which is reported monthly by the Bureau of Labor Statistics. The CPI measures the rate of inflation by determining price changes of a hypothetical basket of goods, such as food, housing, clothing, medical care, appliances, automobiles, and so forth, bought by a typical household. 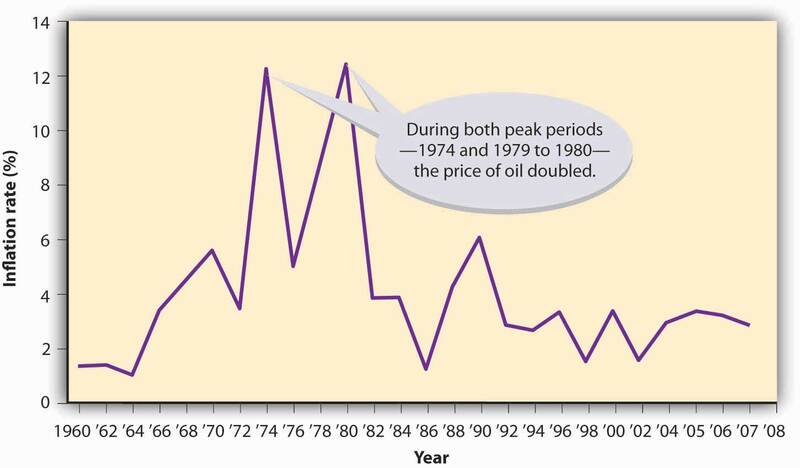 The CPI base period is 1982 to 1984, which has been given an average value of 100. Table 1.1 "Selected CPI Values, 1950–2007" gives CPI values computed for selected years. The CPI value for 1950, for instance, is 24. This means that $1 of typical purchases in 1982 through 1984 would have cost $0.24 cents in 1950. Conversely, you would have needed $2.07 to purchase the same $1 worth of typical goods in 2007. The difference registers the effect of inflation. In fact, that’s what an inflation rate is—the percentage change in a price index. In the previous section, we introduced several measures that economists use to assess the performance of the economy at a given time. By looking at changes in GDP, for instance, we can see whether the economy is growing. The CPI allows us to gauge inflation. These measures help us understand where the economy stands today. But what if we want to get a sense of where it’s headed in the future? To a certain extent, we can forecast future economic trends by analyzing several leading economic indicators. An economic indicatorStatistic that provides information about trends in the economy. is a statistic that provides valuable information about the economy. There’s no shortage of economic indicators, and trying to follow them all would be an overwhelming task. Thus, economists and businesspeople track only a select few, including those that we’ll now discuss. Statistics that report the status of the economy a few months in the past are called lagging economic indicatorsStatistical data that measure economic trends after the overall economy has changed.. One such indicator is average length of unemployment. If unemployed workers have remained out of work for a long time, we may infer that the economy has been slow. Indicators that predict the status of the economy three to twelve months in the future are called leading economic indicatorsStatistical data that predict the status of the economy three to twelve months in the future.. If such an indicator rises, the economy is likely to expand in the coming year. If it falls, the economy is likely to contract. To predict where the economy is headed, we obviously must examine several leading indicators. It’s also helpful to look at indicators from various sectors of the economy—labor, manufacturing, and housing. One useful indicator of the outlook for future jobs is the number of new claims for unemployment insurance. This measure tells us how many people recently lost their jobs. If it’s rising, it signals trouble ahead because unemployed consumers can’t buy as many goods and services as they could if they had paychecks. To gauge the level of goods to be produced in the future (which will translate into future sales), economists look at a statistic called average weekly manufacturing hours. This measure tells us the average number of hours worked per week by production workers in manufacturing industries. If it’s on the rise, the economy will probably improve. For assessing the strength of the housing market, building permits is often a good indicator. An increase in this statistic—which tells us how many new housing units are being built—indicates that the economy is improving. Why? Because increased building brings money into the economy not only through new home sales but also through sales of furniture and appliances to furnish them. All economies share three goals: growth, high employment, and price stability. Growth. An economy provides people with goods and services, and economists measure its performance by studying the gross domestic product (GDP)—the market value of all goods and services produced by the economy in a given year. If GDP goes up, the economy is growing; if it goes down, the economy is contracting. High employment. Because most people earn their money by working, a goal of all economies is making jobs available to everyone who wants one. The U.S. government reports an unemployment rate—the percentage of the labor force that’s unemployed and actively seeking work. 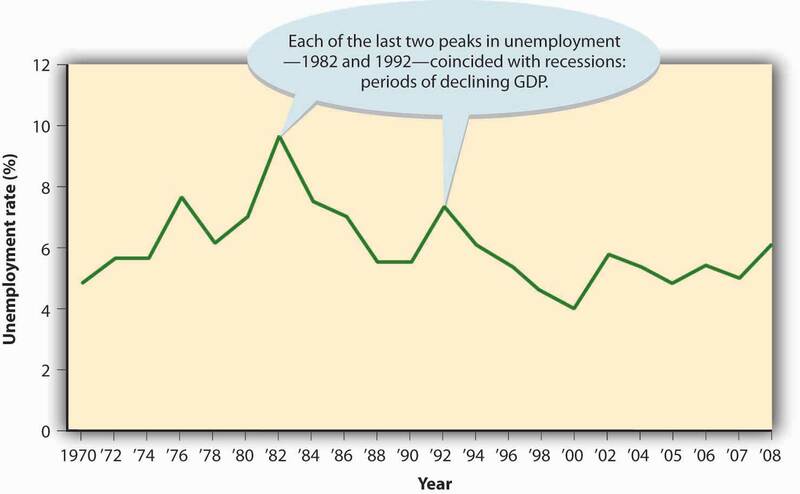 The unemployment rate goes up during recessionary periods and down when the economy is expanding. Price stability. When the average prices of products either don’t change or change very little, price stability occurs. When overall prices go up, we have inflation; when they go down, we have deflation. The consumer price index (CPI) measures inflation by determining the change in prices of a hypothetical basket of goods bought by a typical household. To get a sense of where the economy is headed in the future, we use statistics called economic indicators. Indicators that, like average length of unemployment, report the status of the economy a few months in the past are lagging economic indicators. Those, like new claims for unemployment insurance, that predict the status of the economy three to twelve months in the future are leading economic indicators. Congratulations! You entered a sweepstakes and won a fantastic prize: a trip around the world. There’s only one catch: you have to study the economy of each country (from the list below) that you visit, and identify the current phase of its business cycle. Be sure to explain your responses. Country 1. While the landscape is beautiful and the weather is superb, a lot of people seem unhappy. Business is slow, and production has dropped steadily for the past six months. Revenues are down, companies are laying off workers, and there’s less money around to spend. Country 2. Here, people are happily busy. Almost everyone has a job and makes a good income. They spend freely, and businesses respond by offering a steady outflow of new products. Country 3. Citizens of this country report that, for a while, life had been tough; lots of people were jobless, and money was tight. But things are getting much better. Workers are being called back to their jobs, production is improving, and people are spending again. Country 4. This place makes you so depressed that you can’t wait to get back home. People seem defeated, mostly because many have been without jobs for a long time. Lots of businesses have closed down, and those that have managed to stay open are operating at reduced capacity. What are the three main economic goals of most economies, including the economy of the United States? What economic measures do we examine to determine whether or how well these goals are being met?